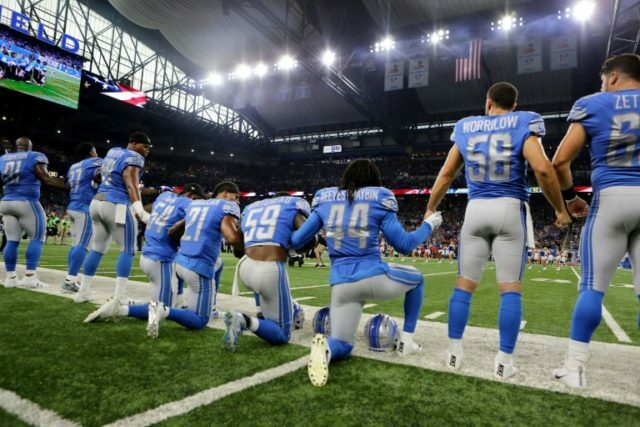 Los Angeles (AFP) – The wave of protests which erupted across the National Football League has been described as one of the most significant displays of athlete activism in decades but experts remain uncertain about the long-term impact of the demonstrations. More than 150 mostly African-American NFL players elected to kneel or sit during the playing of The Star-Spangled Banner on Sunday in an unprecedented protest following a tirade by President Donald Trump. Trump had triggered uproar in America’s most popular sport by attacking players who symbolically refused to stand during the national anthem in an effort to draw attention to racial injustice. The US leader’s remarks were widely condemned by NFL chiefs and billionaire team owners — several of whom had donated to Trump’s election campaign — before the players staged their day of action. Yet as a fresh round of NFL games kick off this week, it remains unclear whether last Sunday’s protests will gather momentum or slowly fizzle out. Some players who kneeled last weekend have already said they do not plan to repeat the protest. Oakland Raiders tackle Donald Penn said his protest was intended as a riposte to Trump’s remarks. The mixed messages have created debate about the long-term effectiveness of the protests. For some analysts the meaning of the demonstrations — which were first started by ex-San Francisco 49ers quarterback Colin Kaepernick — has been lost. Trump has reframed the debate as a question of patriotism, accusing those players who choose to kneel or sit as being disrespectful of the military and the United States. Orin Starn, a professor of cultural anthropology at Duke University who has written about sports and society, sees the protests as continuing a tradition of activism started by black athletes in the 1960s. “There’s a thread connecting Tommy Smith and John Carlos in 1968 to what we saw on Sunday — black athletes using sport to protest racial injustice, to say to America that it doesn’t have its racial house in order,” Starn told AFP. Starn is uncertain though how effective the NFL protests will be in the long-term, suggesting that the opposing viewpoints in the latest round of America’s culture wars remain too deeply entrenched. “About such a pivotal matter for American culture like racism and police brutality, people already have their opinions,” Starn said. “I doubt many minds have been changed one way or the other by this weekend or by Kaepernick’s initial, courageous protest. Winters agreed that the point of Kaepernick’s original protest — launched in response to several killings of unarmed black men by law enforcement who subsequently received little or no punishment — has been forgotten. “There is a misunderstanding what this is about,” she said. “It’s not about the flag, it’s not about the anthem — it’s about racial inequities. Starn, meanwhile, was uncertain about the significance of the number of team owners who joined players linking arms, noting that there appeared to be a division on racial lines between players kneeling and those who chose to stand. “They (the owners) were linking arms with the players — but they were linking arms with the players who were not kneeling,” Starn said.